Download full brief here or read on for summary. 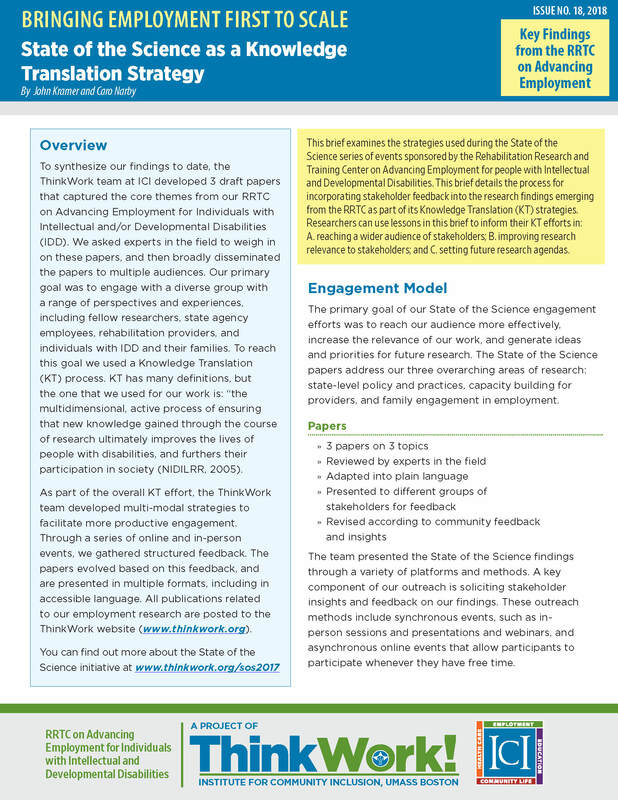 To synthesize our findings to date, the ThinkWork team at ICI developed 3 draft papers that captured the core themes from our RRTC on Advancing Employment for Individuals with Intellectual and/or Developmental Disabilities (IDD). We asked experts in the field to weigh in on these papers, and then broadly disseminated the papers to multiple audiences. Our primary goal was to engage with a diverse group with a range of perspectives and experiences, including fellow researchers, state agency employees, rehabilitation providers, and individuals with IDD and their families. To reach this goal we used a Knowledge Translation (KT) process. KT has many definitions, but the one that we used for our work is: “the multidimensional, active process of ensuring that new knowledge gained through the course of research ultimately improves the lives of people with disabilities, and furthers their participation in society (NIDILRR, 2005). As part of the overall KT effort, the ThinkWork team developed multi-modal strategies to facilitate more productive engagement. Through a series of online and in-person events, we gathered structured feedback. The papers evolved based on this feedback, and are presented in multiple formats, including in accessible language. All publications related to our employment research are posted to the ThinkWork's State of the Science page.